WineFan at Vintage Ridge Vineyard & Winery | FTLapps, Inc.
With over 200 wineries located throughout Virginia, it can be a challenge for wineries to differentiate themselves from the next winery three miles down the road. Of those who have found ways to distinguish themselves, none (so far in our travels) offer the tasting experience provided by Vintage Ridge Vineyard & Winery of Delaplane, Virigina. As you walk into their tasting room, you will notice large doors opened on both ends of the building which give the facility an open barn feel. Where some wineries leave you fighting for space around the tasting bar, Vintage Ridge has implemented a style of wine tasting very similar to the experience you might enjoy at a winery in South Africa or the Mediterranean region. You are seated at a table where you are brought two glasses and a tasting sheet. The two glasses immediately indicate you are going to be tasting two wines at once to compare and contrast them (also known as a parallel tasting). Visiting during the first weekend of the month, we were able to take advantage of their premier tasting. 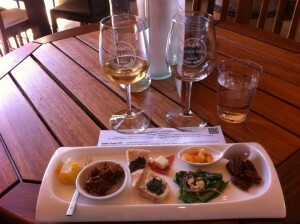 The premier tasting pairs seven different wines, each with small bites of delicious food such as BBQ pork and lemon meringue pie. The wine pours are quite generous, allowing you to sip, take a bite, and then sip again. This really emphasizes how the food and the wine work together to accentuate one another. With each pour, the staff diligently explains the wine and the food pairing. Although the premier tasting costs a bit more than a traditional tasting, it’s an experience that shouldn’t be missed. Once you have completed your tasting, the winery offers a lovely patio reserved for guests who have purchased a glass or bottle of wine. There, you can move outdoors to continue to enjoy your experience at Vintage Ridge. At a production rate of around 1,500 cases per year, the winemaker is able to assemble quite an array of choices for wine enthusiasts to select from. Vintage Ridge provides wines for palettes that prefer a little sugar, as well as wines for those that prefer a big, tannin-forward wine. In addition to enjoying all of the wines on the premier menu that day, we were fortunate to also have the opportunity to parallel taste their 2009 and 2010 Petit Verdot. Notes exported from our WineFan app follow. Citrus notes and hints of pear. No residual sugar. Paired with lemon meringue pie. Pie accentuates citrus flavors in the wine. Blueberry nose. Dark berries on the palette. Paired with kalamata olive tapenade served on pita bread. Spicy with chocolate on the finish. Well balanced oak. Paired with pulled BBQ pork. Harmonious pairing with the Syrah. Dark fruit on the nose. Fruit forward highlighting cherry and plum. Spicy finish. Paired with bellavitano cheese and salami. Fruit flavors of the wine really make the cheese flavors come alive. Herbaceous nose with hints of dark fruit. Well balanced wine. Paired with baguette topped with an herb pesto. Fruity, citrus flavors. Less than 1% residual sugar. Perfect match for spicy Thai food. Paired with cornbread salad and honey vinaigrette. Citrus flavors really come out in wine when paired with salad. Tropical fruit flavors. Up to 1.5% residual sugar. Paired with pineapple salsa. Flavors compliment each other very well. Heavy spice. Could use a few moments in decanter or let it age for a few more years. Very well balanced with spice and fruit. Great with grilled meats.